50 roses mean well-ripened love, no regrets, love that knows no bounds. 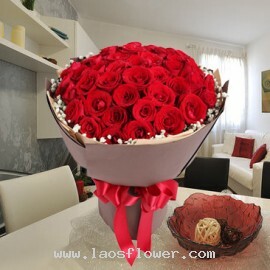 50 roses mean "signify a love that has ripened well, and has never been regretted". 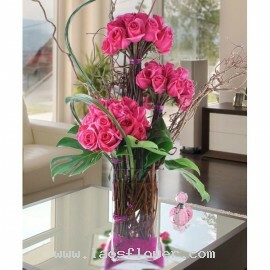 A vase of 50 pink roses arranged separately in 3 bouquets accent with leaves and vines. This stylish vase is perfect for giving to congratulate the business, birthdays, wedding anniversary, open new stores, etc. * The color of roses can be changed as you want, such as red, white, yellow, orange, pea..
50 pink roses arranged in 2 bouquets in a clear glass vase decorated with leaves. This vase is perfect for sending a congratulatory gift for different occasions such as birthdays, open a new business or launch a new store or get well soon. You can choose the roses color such as red, yellow, orange, ..
A bouquet of 50 red roses arranged round shape accent with white gypsophila flower around. Wrapped in brown paper and dark brown on the outside and tied with red ribbon. This bouquet is a perfect gift for someone special on a special day. 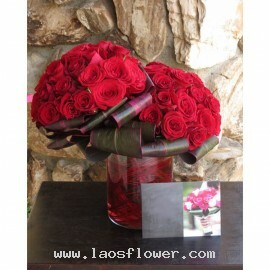 The color of roses and materials used in the bouquet can be r..
A bouquet of 50 red roses wrapped in red paper and white paper and tied with red ribbon. The color of roses and materials used for packaging can be changed as you want. Occasionally, substitutions may be necessary to create your bouquet due to the availability of certain flowers in various parts ..
50 red roses accents with gypsophila in a clear glass vase and tied with red ribbon. The color of roses and ribbon can be changed. Occasionally, substitutions may be necessary to create your bouquet due to the availability of certain flowers in various parts of the country. Substitutions may be n..
A vase of 50 long-stemmed red roses. The color of roses can be changed as you want. Please let us know when ordering or email us. Occasionally, substitutions may be necessary to create your bouquet due to the availability of certain flowers in various parts of the country. 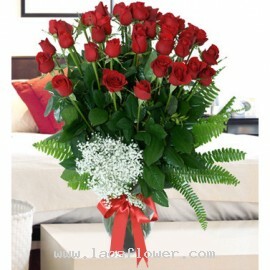 Substitutions may be ne..
A vase of 50 red roses arranged in 2 bouquets in a clear glass vase accents with leaves. We will add a pretty bow on the vase. The color of roses can be changed as you want. Please advise when ordering flowers. Occasionally, substitutions may be necessary to create your bouquet due to the availab..